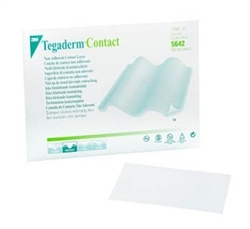 3M Tagaderm Non-Adherent Contact Layer wound dressing provides a unique concept in wound management, rapidly transferring wound exudate into an absorbent secondary dressing. It is a woven, nylon fabric with sealed edges that is non-adherent, non-irritating, and hypoallergenic. The wound contact material is placed over the wound and under gauze or other absorbent dressing. Tagaderm Non-Adherent Contact Layer dressings minimize disruption of granulating tissue. It lessens patient pain during dressing changes and removal. It also maintains a moist wound environment for healing. They can be easily cut to size. Indicated for both partial thickness and full thickness wounds.